It happens to the best of us. The weather's nice, your work day went well, and you even have tomorrow off work but for some reason you feel bummed out. Sometimes the weather can affect our mood or sometimes it's just hormones. To this day I still don't know why I get bummed out on occassion but I do know a few ways that I handle it. 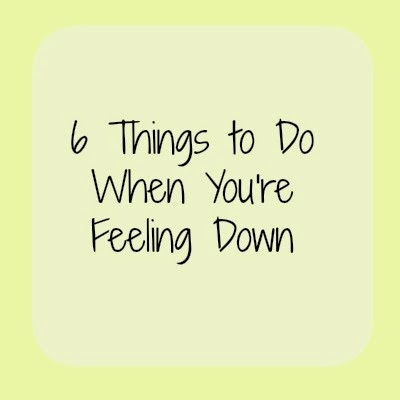 The following suggestions aren't guranteed to make you feel better instantly, but they are ways to pass the time when you do feel down and help take your mind off it. Sometimes it's nice to watch someone elses life unfold and to forget about your own for 2 hours. I watch movies on a weekly basis and I love the mini escape from life. Pick any genre and any movie! Getting lost in a good story is a great time out from your daily life. Your brain is so busy processing what you are reading off the pages that you won't be dwelling on "Why do I feel this way". You don't have to life weights or even do yoga, but just get up and do something. A walk outside always helps me. Not only can I enjoy the scenery but it's good cardio and exercise helps release chemicals in your brain that make you feel good! Seriously, people watching can be fun. Go grab a bite to eat at the mall or a coffeeshop and watch the lives of others around you. I get so caught up in people watching I lose track of time. You'll be entertained by watching people's animated conversations, seeing how people's moods are shown by their body language, and you can get a laugh out of someone fumbling around thinking no one saw them almost trip over their own feet. It's a great distraction. How do you reflect? Well, I can tell you how I do it. It's kind of like meditating. I usually just go sit outside or sit on my bed staring out the window at a tree. I just sit and stare and observe. I watch things and notice things. I see how the leaves move when the wind blows or how the birds keep circling the same worm on the ground. It gives your mind time to decompress and rest and it helps clear your head when you are observing the simplicity of the world around you. Affection is not only one of the love languages that exists but it's a great way to boost your happy hormones. Snuggle with a stuffed animal, your pet, your signifigant other, or even your bestie! Whenever I am having a bad day I always want to watch Breakfast at Tiffany's! Something about it just makes me happy! I have movies like that too!! !